In September, 18 Orfalea College of Business students explored the thriving business environments in Dublin and Cork, Ireland on the most recent Orfalea International Business Tour. The excursion, with students from a variety of Cal Poly business concentrations, was led by accounting Professor Adam Bordeman and Communications Specialist Robyn Kontra Tanner. Students were able to stay at the historic Trinity College in the heart of Dublin as they learned about the city’s rich history. The tour began with a visit to the Unesco World Heritage site, Bru na Boinne and Knowth, ancient chamber tombs set in Ireland’s picturesque countryside. Students also explored the historic Book of Kells and the famed Trinity College Library before making a stop at Teeling Whisky. Students received an exclusive tour of the upstart distillery and met with the founder, Jack Teeling, who discussed how he navigates evolving tastes in the global liquor market. Thanks to alumni connections, the tour’s next day examined why Ireland is a thriving hotspot for multinational corporations, especially tech companies. The day began with a visit to Salesforce, where the team learned about how the company is navigating the impact of Brexit among its offices across Europe, including impact on regulations, talent pools and currency. 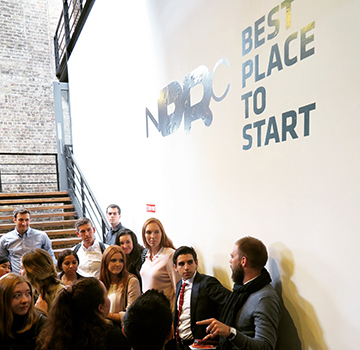 The group then met with leaders of NDRC and Enterprise Ireland to learn how the programs are encouraging innovation among native and foreign ventures. They toured a startup accelerator and talked with entrepreneurs who deliberately located in Dublin from the United States. The group then traveled through the countryside to Ireland’s southern economic hub, Cork. Cal Poly students toured the Cork City Gaol and St. Finbarr’s Cathedral along the River Lee as they got to know the blue-collar nature of the town. The tour then took students to several of the city’s major tech employers, starting with medical device manufacturer Stryker. Students met with the company’s leaders and engineers before touring its state-of-the-art additive manufacturing facility. IDA Cork, which leads the city’s foreign direct investment efforts. Students learned how the government seeded a powerful economic comeback in the early 2000s by partnering with universities and major companies looking for adaptable talent and friendly tax rates. The tour ended on a high note with a behind-the-scenes tour of Apple’s Cork campus. The visit had a particular focus on Apple’s finance division and its strategy around emerging markets with several key leaders. The group also toured Apple’s only in-house manufacturing facility which produces and tests iMacs through a highly skilled workforce and a very sophisticated assembly line. The tour concluded with visits to Kinsale, Cohb and Dublin again before the cohort returned home for the start of fall quarter. The trip was one of four Orfalea International Business Tours the college offered to students in 2017. Others included adventures to Cuba, Spain, Morocco, Japan and Taiwan. For more information on international opportunities for students, visit https://www.cob.calpoly.edu/studentservices/study-abroad/.